The holidays call for decadence and this pumpkin pecan pie layered cheesecake delivers! Read on for the recipe. Holiday baking is one of my favorite pastimes. Doing it with friends and family is just good for my soul. Last year, a sweet friend and I concocted several Thanksgiving-themed recipes and this pumpkin pecan pie cheesecake was one of them! You’ll find my original recipe for pecan pie here. Make sure to check out my new holiday cookbook, with over 50 grain-free, gut-healing recipes for the updated GAPS version of this recipe. You’ll also find honey “wheat” dinner rolls, turkey gravy, more pies, cakes, and cookies, and my mama’s sweet “corn”bread stuffing. It’s a must for the healthy holiday table and you can still grab it in time here. If you’re here for the ridiculously good layered pumpkin pecan pie cheesecake, you’ll find that recipe below. I think I just might break the internet with this one. Let me say it nice and slow: pumpkin cheesecake. Topped. With a layer of pecan pie. Flavor explosion. Deliciousness abounds. This needs to be on your Thanksgiving table. And also your dinner table tonight. And next week, and the following week. At least, I’ll be making it pretty often as we swing into the culinary fall season! 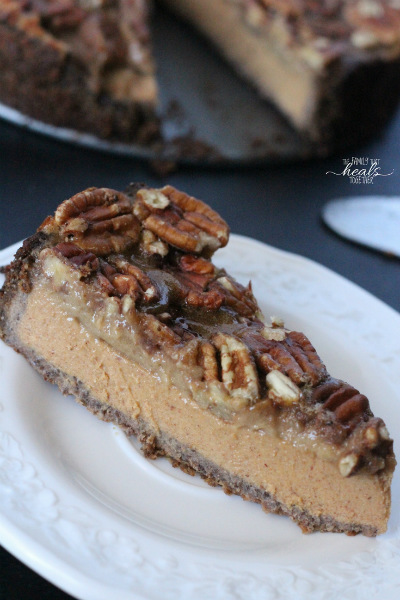 Go grab this pumpkin pecan pie cheesecake recipe and get busy! Crust: Place flaxseeds in high powered blender or food processor and blend on high until the flaxseeds are ground well. Scrape the pecan/flaxseed mixture into a medium sized mixing bowl and add 2 Tbsp butter, 1 tsp vanilla, and 1 tsp cinnamon, mixing well until it becomes a thick dough. Add more butter 1 Tbsp at a time if dough is too dry. Grease a 9" springform pan well with butter (or line with parchment paper if you'd like, which is particularly helpful on the sides). Press the crust evenly into the springform pan, going about an inch up on the sides. Set aside while you make the filling. Pumpkin cheesecake: Combine cream cheese, pumpkin puree, 1/4 cup ea maple syrup and honey, 1 tsp cinnamon, arrowroot, pumpkin pie spice, 1 tsp vanilla and lemon juice in a bowl and mix well with a mixer or stick blender. Pour into the crust and cook for approximately 25 minutes. Remove from oven and, after cooling for a few minutes, place in refrigerator to cool an additional 10-20 minutes. Pecan pie: Turn oven down to 350F. Place butter and maple (or coconut) sugar in mixing bowl. Pour 1/2 cup maple syrup into a small pot and bring to a boil, then pour into mixing bowl, covering the butter and maple sugar, melting them. Add 1/4 cup honey, eggs, 1 tsp vanilla, and salt and combine well with a hand mixer. Top with pecan halves and place back in the oven. Remove and chill for 1-2 hours so that layers don't crumble when cut. What do you do to stick with healthy food during the holidays, when the temptation to “cheat” is so great? 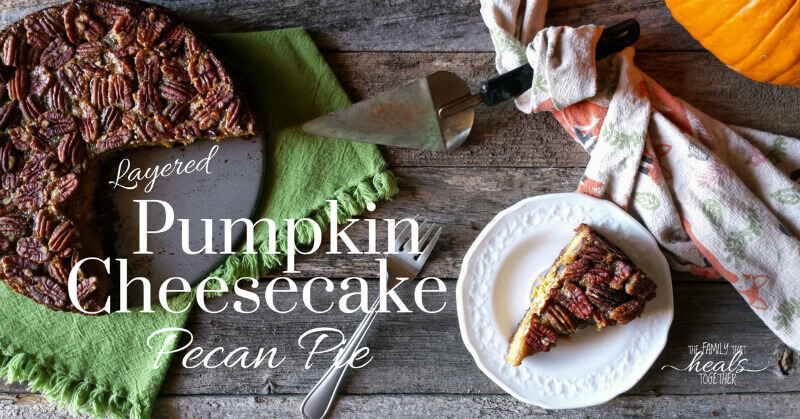 I find that if I get creative and, especially for my kids, remake all of our favorites, plus come up with really fun recipes like this pumpkin pecan pie cheesecake, that no one feels deprived. The best part is when my kids don’t complain about the junkie foods they’re “missing out” on, because I’ve provided them with an alternative they love. Be sure to pin this pumpkin pecan pie cheesecake recipe using our link below! What is MTHFR? And Why Should You Even Care?